Fr. John hails from Detroit, MI. He attended Michigan State University and met his wife, Deborah Robertson, there. He has degrees in English (Michigan State University), Theology (St. Herman Theological Seminary, Kodiak, AK). He completed coursework towards a Masters in Public Administration (Southern Illinois University – Carbondale) and was granted a D.Min. by Veritas Theological Seminary in 2009. His first work in new missionary media was the Incarnation Broadcast Network, the first 24 hour Orthodox Christian internet radio broadcast in the world. He also established the first Orthodox seminary website in the world, and hosted the first Orthodox Media Guild gathering in Chicago in 2004. Fr. 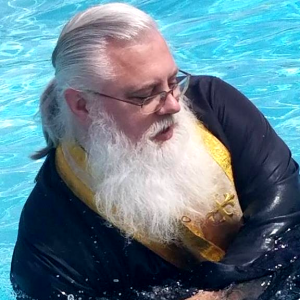 John has served as lecturer in Biblical Studies and Practical Liturgics for St. Herman Orthodox Theological Seminary in Kodiak, AK, the Late Vocations programs of the OCA Diocese of the Midwest, and the Northeast Ohio Catechetical School for Theological Studies. He is the director of the Preachers Institute, an online homiletic resource for Orthodox pastors and preachers, and has been a Featured Homilist at Sermon Central.com, and a national partner and evaluator for the Academy of Preachers. Fr. John is an Amazon #1 best selling author, having written several books, including several workbooks and manuals for instruction: Called To Serve, Student and Leader’s Manuals, Divine Liturgy: A Student Study Text, the Bible Drill/Bible Divas Field Manuals, and S.W.A.T. (Spiritual Warfare And Training). He as written for Orthodoxytoday.org, the American Orthodox Institute, The Handmaiden magazine, the Interior Strength blog, the St. Katherine College website, and others. He was an occasional writer for Charles Staley’s Staley Training Systems website, and have been featured on the Functional Hand Strength, Theory To Practice, and The Masculine Heart websites. He contributed a number of articles for the Orthodox Study Bible and commentary on the Old Testament books of Hosea, Song of Songs, and III Maccabees (perhaps the first Orthodox commentary for this book in existence). He founded Journey To Orthodoxy for helping those seeking inquiring into and seeking contacts within the Orthodox Church, and assisting heterodox pastors in their transition to Orthodoxy. He also launched Good Guys Wear Black, a website designed to help men who are discerning a vocation in the Orthodox Church. Fr. John is the Dean of the GreatMartyr Euphemia Orthodox Theological Academy. He is very happily married, with three adult sons, and a growing number of grandchildren.